ICPAPH, the International Congress on Physical Activity and Public Health, was held in the beautiful city of Rio de Janeiro. This is an important conference for IPEN, because the attendees came from 70 countries, and IPEN supports the Council on the Environment and Physical Activity (CEPA), an official council of the ISPAH. I want to start by congratulating the organizers on a superb scientific meeting with a very successful social program. 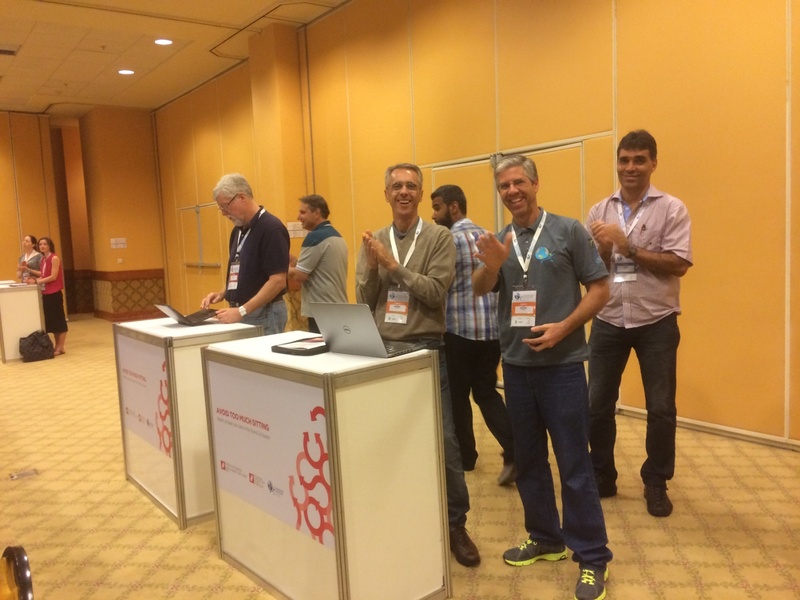 Special thanks to Pedro Hallal, Rodrigo Reis, and the program committee for ensuring the scientific quality of the meeting. We had several CEPA sessions that were well-attended and of high quality. I congratulate Takemi Sugiyama, outgoing chair of CEPA, for organizing three excellent sessions. The CEPA symposium was packed with new data and convincing demonstrations that CEPA is moving the field forward. After my brief overview of IPEN, Jens Troelsen presented new IPEN Adult data from Denmark, and Erica Hinckson presented IPEN Adolescent data from New Zealand. Leaders of working groups presented very encouraging progress on almost all of them, and I believe attendees realized they could get involved in substantive international collaborations through CEPA. Billie Giles-Corti presented 10 specific strategies for conducting policy-relevant environment research, which are detailed in a paper developed by the Policy Working Group that is currently under review. This will be a useful guide for IPEN investigators and the broader field. Akira Hino presented strong ongoing collaborations among Latin American investigators. Jasper Schipperijn and Hayley Christian reported on review papers and other projects that have resulted from the Urban Green Spaces Working Group. Jelle Van Cauwenberg presented a review on environments and older adults’ physical activity, which has been published in IJBNPA. Adewale Oyeyemi described how the Africa Working Group is making excellent progress developing a version of the NEWS instrument for Africa. (NEWS-Africa was the subject of an earlier blog). The CEPA symposium was a good introduction to the CEPA meetings over the next two days. In the first meeting, it was agreed that Rodrigo Reis will be the new CEPA Chair, and the new leaders are listed below. All existing groups will continue working, and there were suggestions for a new working group on social issues (such as safety and culture). One particular advancement was that the Early Career Working Group will be expanded to become a function of the entire ISPAH. This working group was seen as a good model to fill an important need, so new ISPAH President Fiona Bull volunteered to work with CEPA to accomplish this expansion. The first meeting ended with discussions among working groups as they made realistic actions plans to be accomplished over the next two years. The IPEN Coordinating Center will continue to support the working groups. The second CEPA meeting was devoted to the Early Career Working Group. The lunchtime meeting was heavily attended and was designed for senior investigators to respond to the stated needs and questions of early career researchers. Both large-group discussion and small-group consultations were held. Many thanks to Neville Owen, Billie Giles-Corti, Jo Salmon, and Ulf Ekelund who offered their guidance. My assessment is that CEPA is performing useful functions for the environment and physical activity field, so we will start planning for CEPA activities in Bangkok, Thailand in 2016. CEPA meeting with Early Career Researchers, with Neville Owen providing guidance. CEPA meeting with Early Career Researchers, with Billie Giles-Corti mentoring in a small group session. 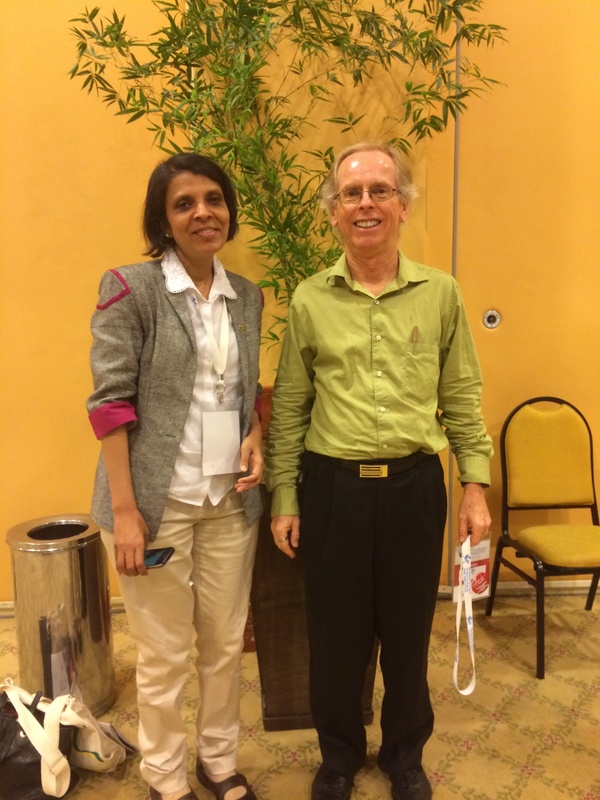 There were two notable advances for IPEN that came to my attention at the Rio meeting. First, I learned that an IPEN Adult study is being conducted in Chile, led by Jaime Leppe Zamora. The funds are already available, and the Latin American survey will be adopted. This was wonderful news, and this new study was largely due to support from the Latin American IPEN investigators. Second, I met Shifalika Goenka, who is a physician in India with a well developed interest in built environments and physical activity. She has written a book under the auspices of the regional WHO office that advocates for healthy environments and policies. She is very interested in pursuing an IPEN Adolescent study in India that can be included in the pooled dataset. We will work with her to identify funding for such a project. 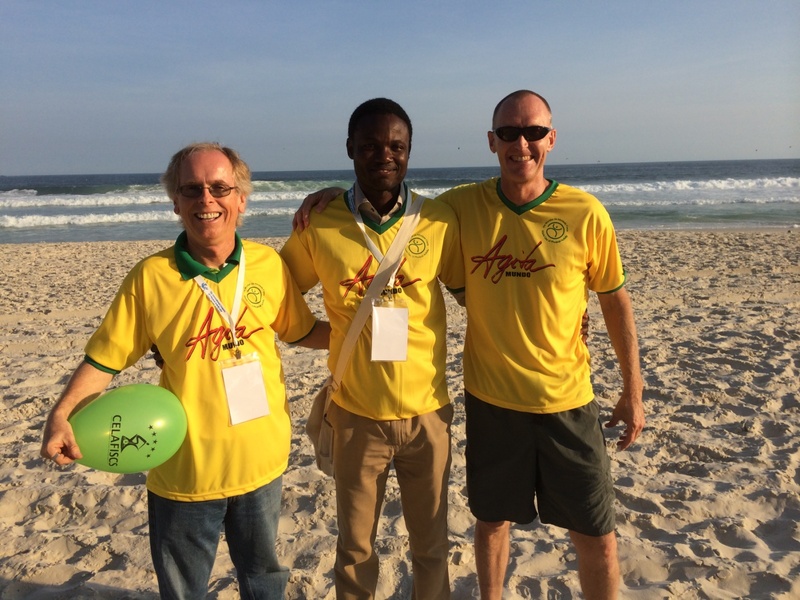 I made several other friends in Rio, but these two encounters were particularly meaningful for IPEN. There were many other highlights of the meeting, and some of them are partially captured in the photos. There were abundant standing tables at the back of many meeting rooms, and they were well used. 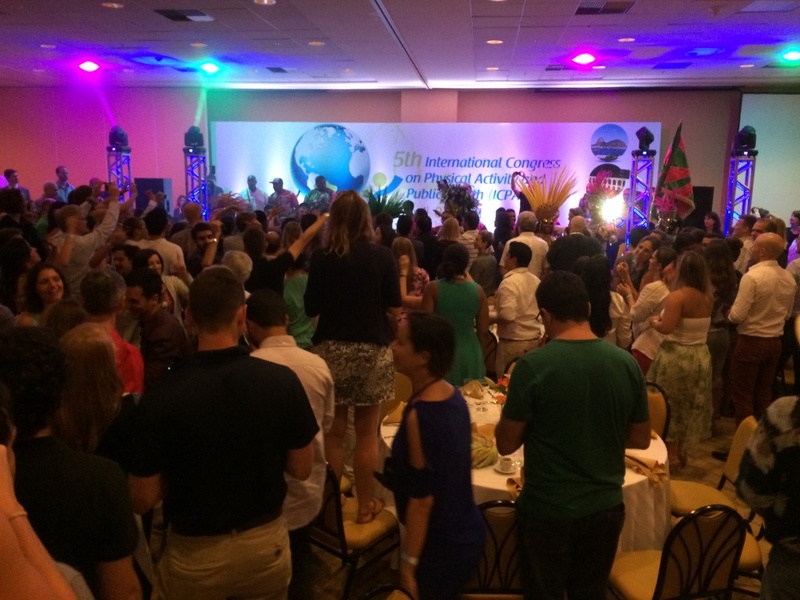 The conference banquet transformed into a samba parade and then into a disco that gave attendees a welcome opportunity to be active. 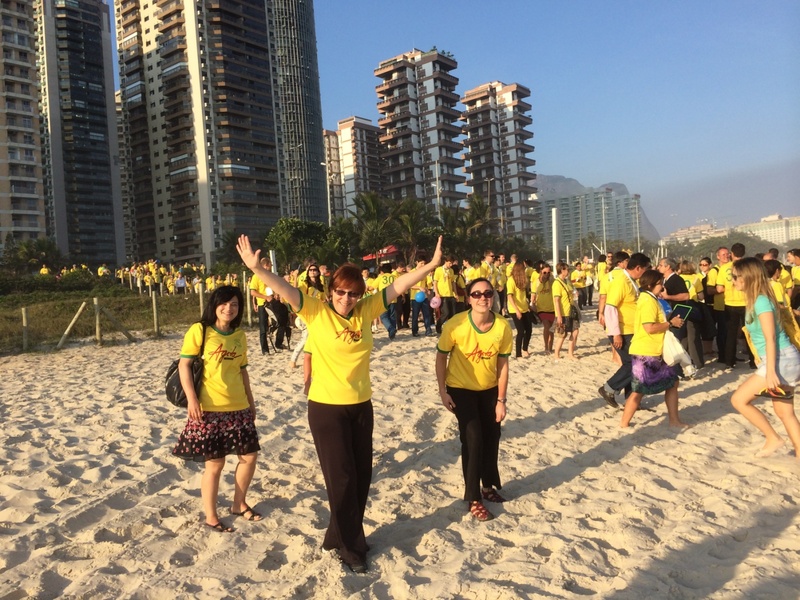 Victor and Sandra Matsudo organized an Agita Mundo parade to the beach, and hundreds of participants in yellow jerseys spelled out “Agita”. After an intensive and stimulating scientific conference, I was able to spend a day touring some spectacular beaches and Sugarloaf Mountain. It was great that so many physical activity experts from around the world were able to visit Latin America for the first time. 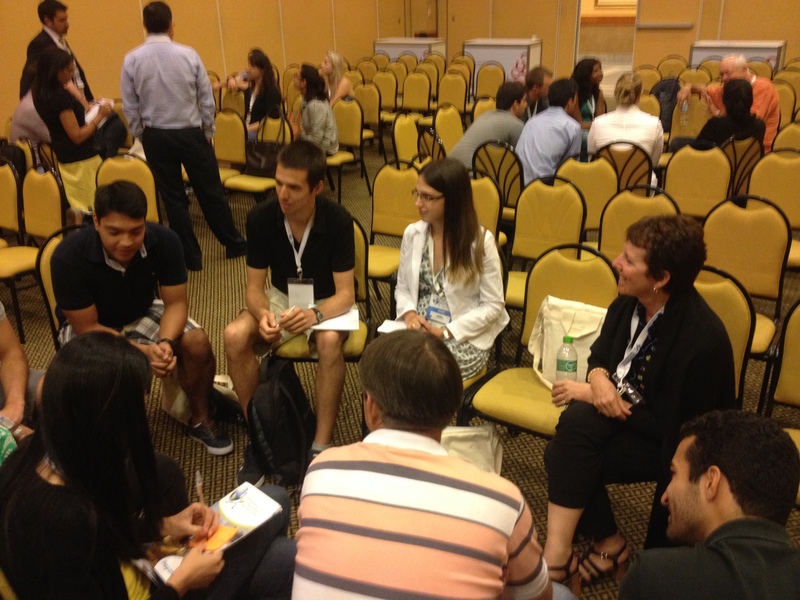 ICPAPH in Rio was a big boost for IPEN as well as international physical activity research in general. Brazilians were early adopters of the standing tables in most meeting rooms. Lise Gauvin celebrates the Agita Mundo parade. 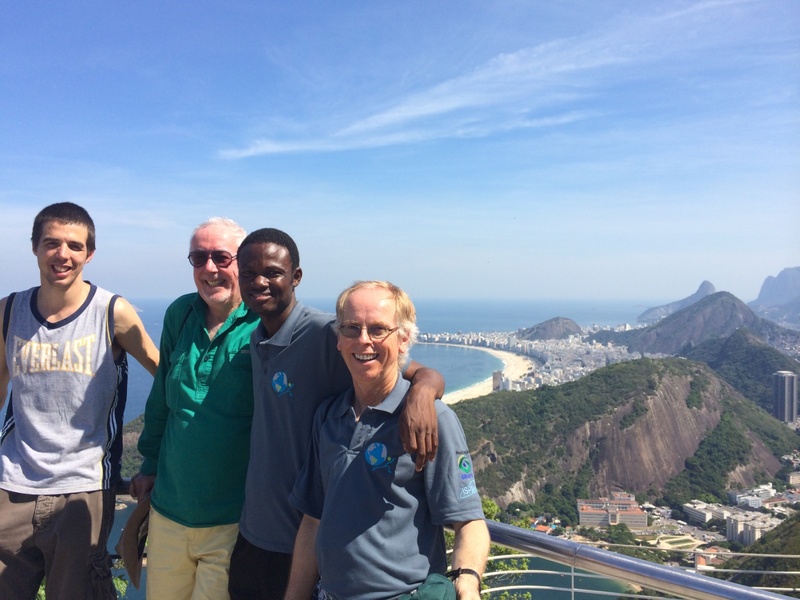 Jelle van Cauwenberg, Neville Owen, Adewale Oyeyemi, and Jim enjoy the view of Copacabana Beach from atop Sugarloaf Mountain. By drjamessallis in Uncategorized on May 1, 2014 .